Every 18 months we bring Karl Hudson over from Kiel in Germany to service our drum scanners. This weekend Karl spent two days on both of our Heidelberg machines, bringing them up to factory standard conditions. The good news is that both scanners are running fine and with Karl’s help we hope to have them running for a long time to come. As part of the work, I asked if we could try to clean the lens elements of the scanner and between Karl and I we took the lens out of the machine and extracted the lens elements. After giving them a good clean they all went back in and the scanner passed all of the tests with flying colours. As far as Karl knows, this is the first time a machine has had this process undertaken. 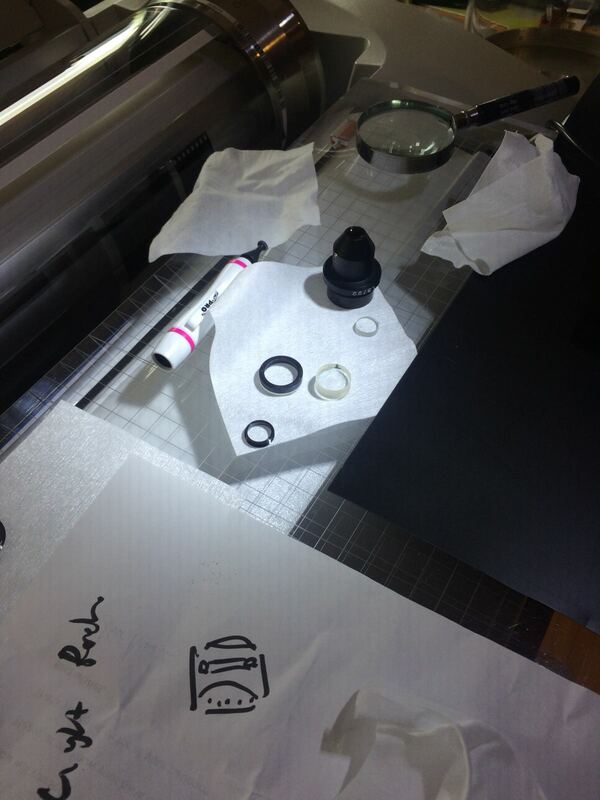 Here’s a photograph of the lens with all of its elements extracted and a rough lens diagram alongside it. The lens is actually quite a complicated design made by Meopta (with the code f/1.3 22mm on the side). It looks like an apochromatic lens design. One group of two at the drum side and then a group of three at the back (the apochromatic group) and then a single element at the very back. All very interesting but now it’s back to scanning again!